Drumsite is a music instrument tool which can create synthetic sound sequences and drum sounds; it's mostly targeted towards novice instrument players learning the ropes. The application interface seems a bit complicated, but it contains a number of features which make it a pretty good tool to get started creating music and learning different MIDI instruments. With this audio processor, you can create loops and insert different patterns to the music sequence. 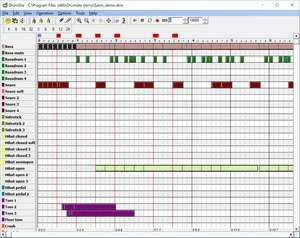 Drumsite also supports Midi files which can be quite useful in learning how to create music and understanding how Drumsite works. Drumsite 1.7.0.1 is a shareware program and can be used as a demo to try the software until the free trial period has ended. A full version of the program is available after the trial period ends. For security reasons, you should also check out the Drumsite download at LO4D.com which includes virus and malware tests. Additional screenshots of this application download may be available, too. Drumsite has a presence on social networks.